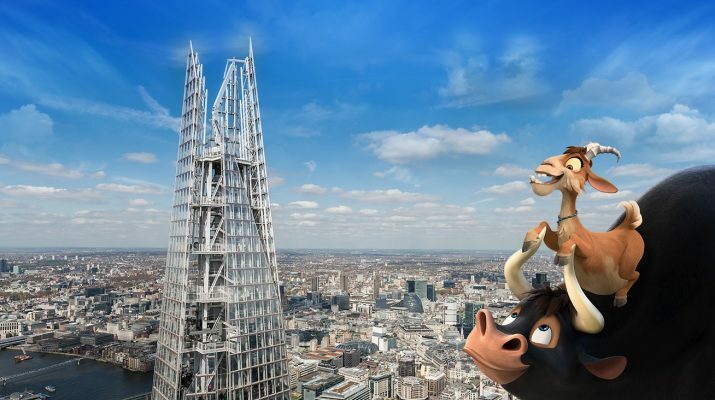 This school holidays, The View from The Shard are teaming up with the friendliest bull in town, FERDINAND, a family animated comedy, to create exciting entertainment for all the herd. London’s tallest attraction will be hosting a range of fun-filled activities throughout the day, all FREE with a general admissions ticket. Children and adults alike can take part in a Ferdinand-inspired treasure hunt to help find his favourite flowers, and spot some of London’s most iconic landmarks along the way! There will also be face painting avail-a-bull and every hour guests can expect their own mini ‘fiesta’ where children will be invited to join a dance workshop, to release their wild side, with prizes to be won! But that’s not all, to celebrate the new film charging onto DVD and Blu-ray, The View from The Shard will be offering one lucky family a holiday to the fiesta capital, Barcelona! Plus with every family experience ticket purchased, guests will receive a free gift bag filled with ador-a-bull treats for all the family. To help you enjoy the incredible views of London, the attraction has included an official guide book about everyone’s favourite city, to answer any questions your little one has on the iconic capital and a selfie stick to help create the ultimate selfie. A special Ferdinand floral display will be situated in front of the window of the attractions open-air sky-deck, creating the perfect photo opportunity to help guests smell the flowers with love-a-bull Ferdinand, whilst enjoying un-bull-lievable panoramic views of the capital! Whilst here families can also take on ‘The Slide’, an adrenaline-fuelled 360-degree virtual reality experience that swoops and slides through the city’s skyline. The hair-raising journey takes you on an extreme multi-sensory journey where The Shard becomes a helter-skelter! Guests can also test their nerve and fear of heights on Vertigo! This virtual adventure sees the building fall away, leaving you suspended in the air, walking across The Shard’s early infrastructure and balancing on the stripped back construction site. Grown Ups can entertain themselves with a glass of Moët & Chandon from London’s highest champagne bar 800ft above the capital whilst enjoying views of up to 40 miles, there is no better way to entertain the kids this school holidays! FERDINAND cattle-pults its way to Digital Download on 10th April and 4K Ultra HD™, Blu-ray™ and DVD on 16th April.